Obituary for Robert Bob Duff | Penzien Funeral Homes, Inc.
Robert “Bob” Duff, 87, of East Jordan and formerly of Boyne City passed away peacefully on Sunday, June 17, 2018, at Villa By The Bay in Petoskey. He was born on March 4, 1931, in Petoskey, the son of Martin J. and Alice (Bunn) Duff. He grew up in Boyne Falls. On November 14, 1953, in Boyne City, he married Wiliminta “Billie Jo” Howie. They were married for 61 years. Bob and Billie Jo started their lives together in Flint. They later moved their family north to her hometown of Boyne City where they raised their four children. 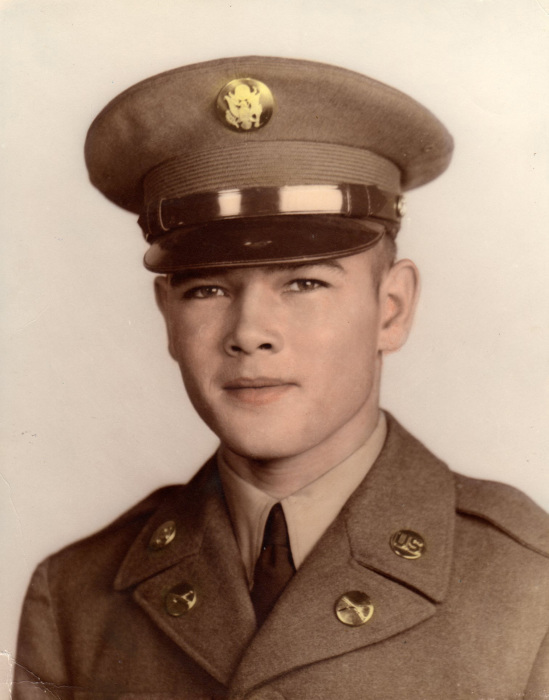 Bob was proud of his service to his country in the United States Army during the Korean Conflict. He was a Purple Heart recipient. Bob had retired from Consumers Power. He is survived by four children, Kelly (Barb) Duff of Grand Rapids, Shelli Duff Hesselroth of Golden Valley, Minnesota, Barb (Dan) Yenglin of Charlevoix and Susie (Dean) Hicks of Boyne City; grandchildren, Kevin (Holly) Duff, Patrick (Angel) Duff, Molly Duff, Sara Hesselroth, Jake Hesselroth, Bailey (Visar) Grajqevci, Brock (Madison), Katie Hicks, Kylie Hicks; three grant-grandchildren, Ariana Grajqevci, Adrian Grajqevci, and Lilliana Duff; three brothers, Thomas (Diane) Duff of Jackson, Dalton Duff of Atlanta and Dean (Karen) Duff of Sterling; and several nieces and nephews. He was preceded in death by his wife, Wiliminta “Billie Jo” Duff, on March 7, 2015; his parents Martin and Alice Duff; twin sister, Barbara Jenson; sister, Blanche Kurtz; brothers, Jim and Dan Duff. Bob’s family will remember him as a very loving and devoted husband, father and grandfather. He always put his family before all else. He will be missed dearly. Military honors will be held on Friday, June 22, 2018, at 11:00 A.M. at Veterans Park in Boyne City and a family/friends gathering following in the park’s pavilion. In lieu of flowers, the family suggests memorial contributions be made to Hospice of Little Traverse Bay, One Hiland Drive, Petoskey MI 49770. Arrangements were handled by the Penzien Funeral Homes, Inc. in East Jordan.